Cats are particularly clean animals and love to find cleanlineΒ and freshneΒ in their homes. Catsan Active Fresh Clumping Litter is an innovative, extremely absorbent clumping litter for a dry, fresh and hygienic toilet area. The clumping litter is made from specially selected natural white clay granules, which have a particularly effective clumping system. 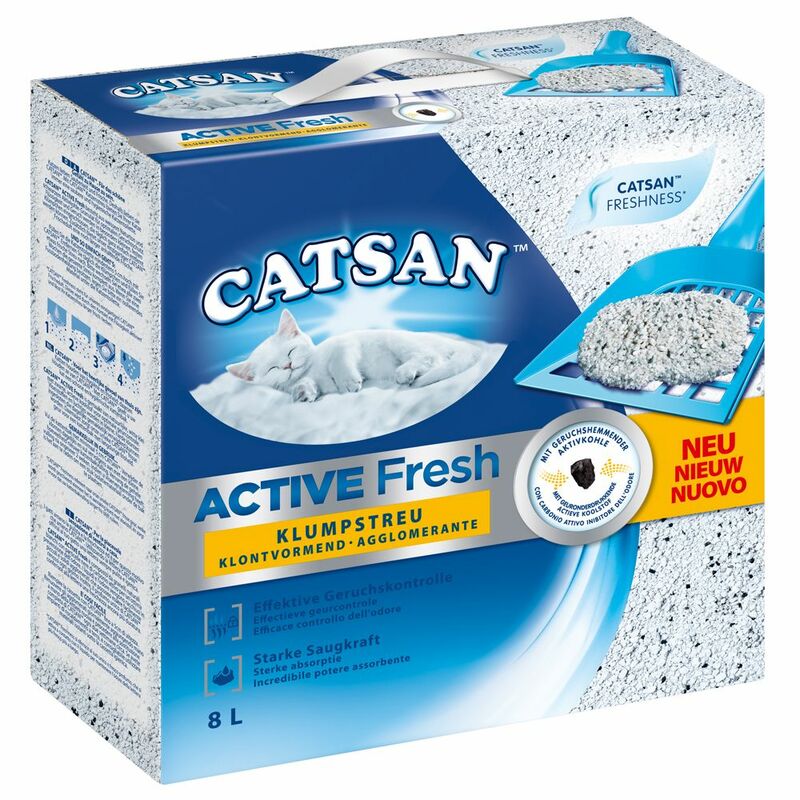 Activated carbon granulate reliably controls odours and has a unique fresh scent that is activated by moisture, completing this Catsan Active Fresh Clumping Litter and ensuring hygienic cleanlineΒ and freshneΒ. The activated carbon is made from renewable natural raw materials such as coconut shell and wood. It is a highly proud carbon with an enormous inner surface, with a single gram of activated carbon equating to 1000qm of surface. This ensures that unpleasant odours are effectively absorbed in your cat's litter tray. The fresh scent of Catsan Active Fresh Clumping Litter is activated when the white clay granules absorb moisture. This ensures that a delightful scent is released before nasty smells make their way into your home! The Catsan Active Fresh Clumping Litter is extremely low in dust thanks to dust-binding additives, helping prevent dust flying around when filling and emptying the litter tray. Your cat will feel fabulous and enjoy a pleasant litter tray area with this Catsan Active Fresh Clumping Litter! Catsan Active Fresh Clumping Litter at a glance: Clumping cat litter Reliable clumping and strong absorbency: thanks to white natural clay Unique fresh scent: activated by moisture, to release its effects before bad odours settle in Effective odour control: thanks to activated carbon, a highly-porous charcoal substance Extremely low in dust: thanks to dust-binding additives Forms small, strong clumps that can easily be removed on a daily basis. Price just £17.99! Click here to buy now!